True, but bor—ing! By the second line, members of the audience would be checking voicemail with their cell phones, answering email on their PDAs, or catnapping. They would not be engaged. Why? Because a clinical rendition omits context and character. It is from those two elements that good stories emerge. Through storytelling, leaders can frame a current experience through the prism of context and character—their own or someone else's. Stories can be used to uplift the spirit, to caution the unwise, to provide insight into experiences, and even to laugh at a situation. 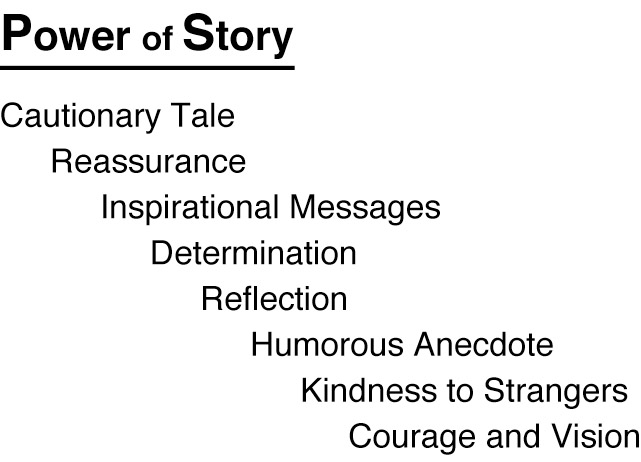 Leaders who learn to tell stories are leaders who are innately aware of the human condition, an insight that prepares them to lead others (see Figure 12-1).